We are located right on the doorstep of the Southern Alps, an awesome area for getting away from it all. 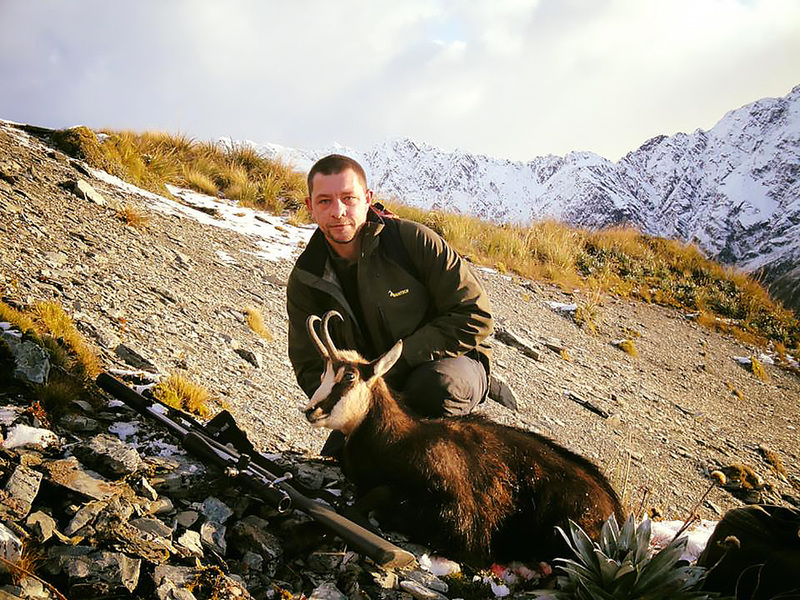 We can access areas for all levels of hunting ability with experience & advice to help you with your backcountry hunt. Click on the button below to download our latest Hunting info pack with answers to all your frequently asked questions. Chamois arrived in New Zealand in 1907 as a gift from the Austrian Emperor, Franz Joseph. The first surviving releases were made in the Mt Cook region and these animals gradually spread over much of the South Island. Today they remain widely dispersed but are not evenly distributed. The Tahr arrived here by ship via an English game park (Woburn Abbey) and they have thrived ever since, albeit within a restricted range. Tahr inhabit the main mountain ranges of the South Island of New Zealand between the Arthurs Pass and Haast Pass highways. Mostly they live at an altitude above 4500 feet and below 7000 feet. A high level of fitness is required due to the rugged environment that Thar inhabit. If you are wanting to access world class rivers, the West Coast is the place to be. We are only short distances from some fantastic rivers for different skill levels. Rivers that we can fly you into include Taipo, Kokatahi, Toaroha, Hokitika, Whitcombe, Waitaha, Wanganui & Perth Rivers. Our pilots have great local knowledge of put ins as well as conditions of rivers. Contact us for more information and pricing for groups & individuals. Looking to gain access to some of the most remote and spectacular wilderness in New Zealand? Let us take you there. When you fly with AHL you can be assured you are flying with experienced & safe pilots with a wealth of local knowledge. We have been taking people into the remote regions throughout the Southern Alps and the West Coast for over 30 years. This invaluable experience and local knowledge will get you economically, quickly and above all, safely to where you want. A fantastic guide for planning your trip is the website Remote Huts. This site has route guides, photos & description of huts. A great resource by local volunteers. Helicopter transport enables anglers to experience the challenge of rainbow trout and brown trout fishing with dry fly or nymph in pristine South Island wilderness streams and rivers. AHL have been taking people into the remote regions throughout the Southern Alps and the West Coast for over 25 years. We can arrange local fishing guides if required. We can also store your vehicle in our secure parking while you are in the wilderness. Our aim is to give you a professional, personal and safe transport service.